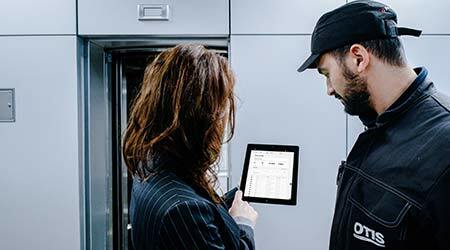 Otis ONE IoT service platform is the company's connected elevator solution that personalizes the service experience through real-time, transparent information sharing, proactive communication tools, and predictive maintenance insights. Within this connected digital ecosystem, information is gathered directly from elevators and escalators via smart sensor technology. Data is then sent to the cloud where it's aggregated and analyzed, and delivered to customers and Otis' dedicated service teams, all in real-time. Otis ONE leverages data from more than 300,000 connected units to create predictive insights and a more proactive service solution for customers. Otis customers will benefit from real-time health data about their equipment. Using the Otis ONE Campus View, they can also instantly view the entirety of their connected Otis portfolio all with the click of a button. Otis ONE enables easy access to real-time information on equipment performance. And for Otis customers, Otis ONE's two-way video connection between the elevator car and OTISLINE assures passengers will not be alone if help is needed.